In a blinding flash, every human is petrified and turned into a statue. Civilization gradually falls apart. When high school student, Taiju, reawakens, bursting from his stone shell, he is shocked to discover that it is 3700 years later! And he is not alone, as his classmate, Senku, has been up and running for over half a year. Now, the duo and more reawakened humans must kick-start civilization, which will not be easy, as not everyone agrees on how civilization should be rebuilt. Dr. Stone, Vol. 3 (Two Million Years of Being; Chapters 17 to 25) focuses on Senku. In the wake of the attempt on his life (by his rival, Tsukasa Shishio, “the strongest primate high schooler”), Senku has found another tribe of humans, after accompanying the beautiful Kohaku. But this new tribe seems to be made of primitive people, or at least, people who act like primitives. But Senku is determined to get them to help him create his kingdom of science, even if he has to make ramen for them. THE LOWDOWN: The Dr. Stone manga is an odd shonen manga, but it is constantly expanding its scope. I was not sure how much I would warm to the series, but now I am fascinated by the ambitions of its creative team. 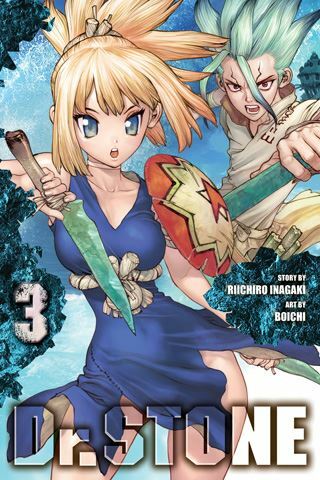 Dr. Stone Graphic Novel Volume 3 focuses on Senku. Writer Riichiro Inagaki uses that to bring in a new group of characters, and also to show the inventiveness of his science-loving star, Senku. The result is a group of delightful new personalities, which makes me think that there is so much more to discover about this series. Artist Boichi delivers a beautiful new pre-history, and Caleb Cook offers spry dialogue. Dr. Stone is turning out to be a shonen time-twisted hit. I READS YOU RECOMMENDS: Readers looking for odd shonen manga will want to try the Shonen Jump title, Dr. Stone.